A terrorist has killed 2, injured many more and is reported to have hostages in Trebes, south-east of Toulouse, France. It is being reported that the terror attack is “Vengeance for Syria.” The terrorist is said to have pledged allegiance to ISIS and yelled, “Allahu Akbar (God is greatest), I’ll kill you all” as he entered the French supermarket. The shooter demanded the release of Abdeslam, who is on trial for attempted murder and possession of weapons over the 2015 Paris attacks in which 130 were murdered. The hostage-taker is said to be a Moroccan national in his 30s known to the intelligence services. A SUSPECTED ISIS gunman has killed two and wounded a dozen others as he took eight hostages at a French supermarket, according to police.The attacker, who screamed “Vengeance for Syria!” before shooting at cops in Trebes, south-east of Toulouse, also demanded the release of Paris attacker Salah Abdeslam. He is understood to have fired six shots at a group of police officers who were jogging down the street, hitting one in the shoulder, leaving him in a life-threatening condition. The attacker then stormed the Super U store in a suspected terror attack and killed a store worker who is understood to be a butcher. He released seven hostages, leaving just him and another cop inside. “A butcher in the U-Supermarket has been shot dead,” according an unnamed source in the town. The man entered the shop screaming “Allahu Akbar (God is greatest), I’ll kill you all”, Mayor Eric Menassi told LCI TV. A Utah teen has been arrested after a homemade explosive device was the item discovered in a backpack at Pine View High School. Authorities stated that if the device had detonated, it would have caused significant injury or death. It was also learned after serving a search warrant that the suspect had been researching information and expressing interest in ISIS and promoting the organization. And not a gun to be found, just a home made bomb. This is an example of what happens when the police, school officials and SRO do the right thing. (KUTV) — A juvenile was arrested Tuesday morning after a ‘potentially’ dangerous homemade device was found at Pine View High School on Monday. The juvenile was interviewed as a person of interest, police say. UPDATE: Police said a homemade explosive device was the item discovered in a backpack at Pine View High School Monday, that forced the evacuation of the school. Police said if the device had detonated, it would have caused significant injury or death. Police have a suspect in custody. The suspect was arrested and faces charges of manufacture, possession, sale, use or attempted use of a weapon of mass destruction. More charges may be pending, according to police. It was determined that if the device had detonated, it would have caused significant injury or death. It is being reported that there has been a possible terror attack and explosion at NYC’s Port Authority at approximately 7:30 am ET. Law enforcement officials have stated that the explosion was believed to be an “intentional act.” The suspect was carrying some sort of pipe bomb or other type of improvised explosive device that either went off prematurely or only partially detonated. The blast went off in an underground subway passage just 200 feet from the terminal at West 42nd St. and Eighth Ave. There are reports of a possible terror attack in New York City, after an explosion was felt Monday morning in a Subway station near Times Square. Commuters said they felt a blast in the Subway tunnels underneath the Port Authority Bus Terminal around 7:30am. The bus terminal is a major transit hub for people commuting to and from New Jersey by bus, and is located just a block from Times Square. UPDATE I: Terror suspect in Custody. One person is in custody after an improvised pipe bomb exploded during the morning rush Monday near the Port Authority Bus Terminal. The device was apparently being carried by a suspect when it exploded prematurely. That suspect was injured and is in custody. The suspect has only been identified as a man in his 20s, possibly from Brooklyn, CBS2’s Reena Roy reported. Sources said the suspect had a second device on him, CBS2 reported. The suspect apparently suffered a laceration to his thigh in the blast. UPDATE II: ISIS Inspired terror attack. The man has been in the country for about seven years, Bratton said. A homemade pipe bomb detonated in an underground walkway beneath the bus terminal near Times Square. Suspect Akayed Ullah, 27, and five other people were injured. – He lives in Brooklyn and is of Bangladeshi descent, two law enforcement sources said. – He has no criminal record in the US, according to a preliminary background check. – Ullah also has no criminal record in his native Bangladesh, according to Sahely Ferdous, a Bangladesh police spokeswoman. Ferdous said Ullah last travelled to Bangladesh’s capital Dhaka — where he was born and raised — in September, but police had no information on why he was there. – Ullah recently did electrical work close to Port Authority with his brother. That brother lives in the same apartment building as Ullah, according to law enforcement. 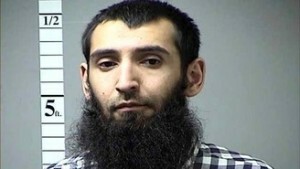 According to the New York Post, Sayfullo Saipov, the Uzbeki national accused of killing eight people on the Lower West Side Manhattan bike path this week on October 31, asked if he could hang the ISIS flag inside his Bellevue Hospital room. No, but we can hang you. I am surprised to do-gooder group has not said its his right to do so. The Uzbeki national accused of killing eight people on the Lower West Side bike path was so loyal to ISIS that he asked if he could fly the terror group’s flag inside his Bellevue Hospital room, authorities revealed Wednesday. Sayfullo Saipov also boasted that “he felt good” about the Tuesday-afternoon pickup truck attack, which injured 18, according to a federal criminal complaint. Federal prosecutors said Saipov was inspired to commit mass murder by watching hours of ISIS snuff films on his cellphone, and had been plotting the heinous attack for at least a year. “In particular, Saipov was motivated to commit the attack after viewing a video in which [ISIS leader] Abu Bakr al-Baghdadi .?.?. questioned what Muslims in the United States and elsewhere were doing to respond to the killing of Muslims in Iraq,” the complaint says. President Trump says this “animal” should get the death penalty. Many agree.